Olamic's roots lie in Russian-made Damascus hunting knives and this one is a prime example of why their blades are so sought after. The Voykar Scout has a military-inspired design anchored by a slim Clip Point blade made from Olamic's proprietary H.C.V.D. steel forged in-house. The handle is monoblock hand-carved Micarta with white/black/white G10 spacers and matching Damascus fittings. This is a fully handmade knife from a limited run and is stamped with a unique serial number. A dangle-type leather sheath is included. 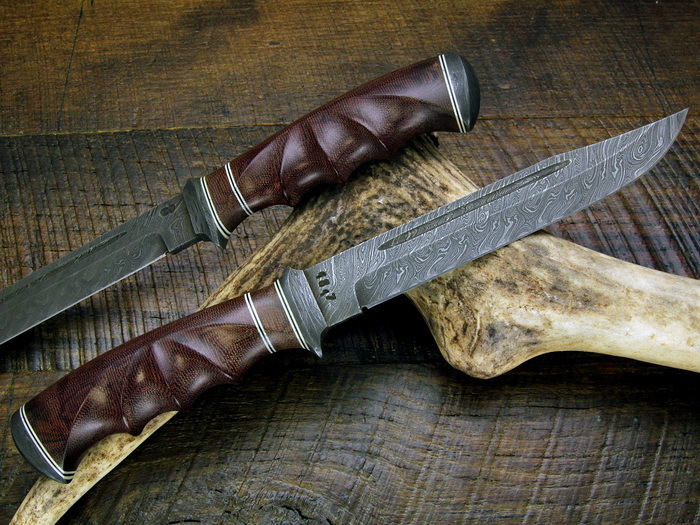 We are a “custom-tech” maker of hunting knives, collector knives, Damascus knives, and custom knives. Our specialization is High Carbon Vanadium Damascus but we can work with a variety of blade steels and handle materials.